In comic books, geniuses live like kings. Cool powers (both super and authoritative), good-looking significant others, and the respect of billions. While society can argue otherwise, comic books are sort of a soap opera for nerds, so why not glamorize the culture that supports the industry? 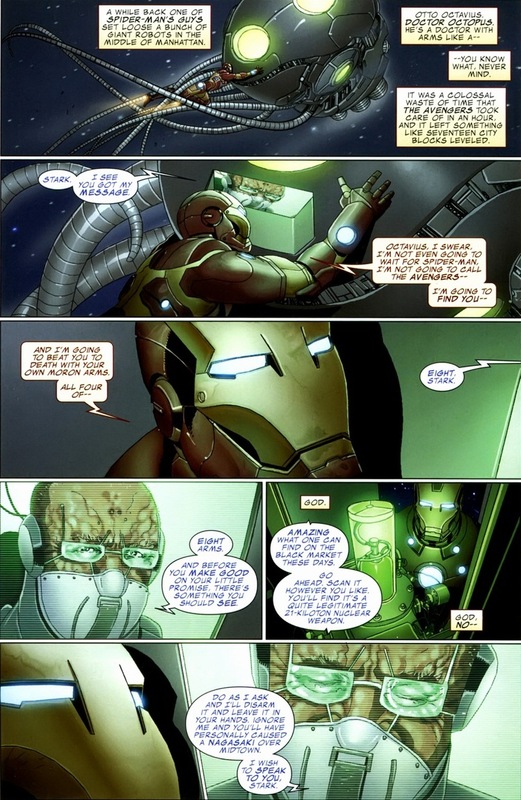 And in the comic book world, I think Tony Stark’s intelligence gets a little downplayed nowadays in favor of his pew-pew armor, and that’s unfortunate. He’s almost certainly in the top ten smartest people in the world and can easily go scientifically toe-to-toe with genius heavyweights like Mr. Fantastic, Hank Pym, Black Panther, and Beast. Oh, and Doctor Octopus. 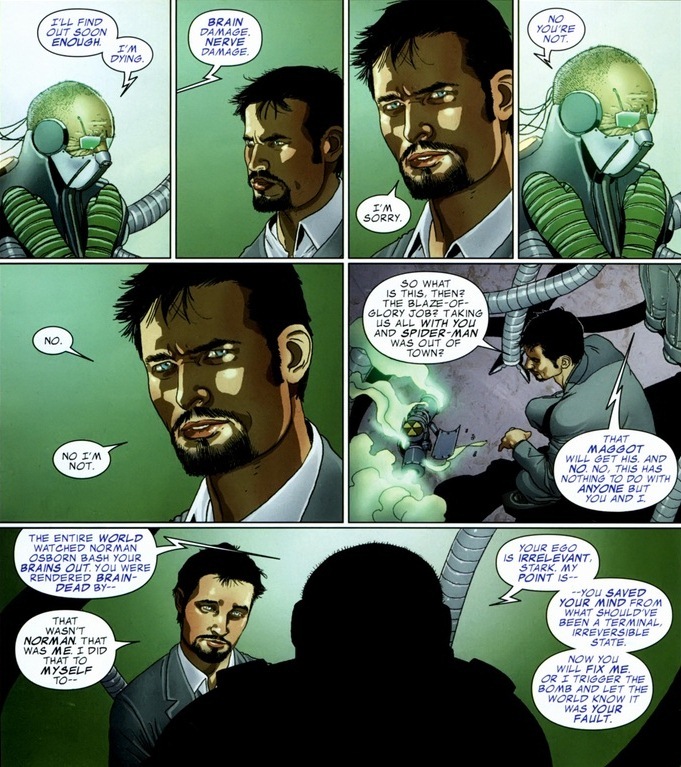 In Invincible Iron Man #501-503, written by Matt Fraction and drawn by Salvador Larroca, we see the two scientists at their peak with dangerously high stakes — like most science competitions I imagine. 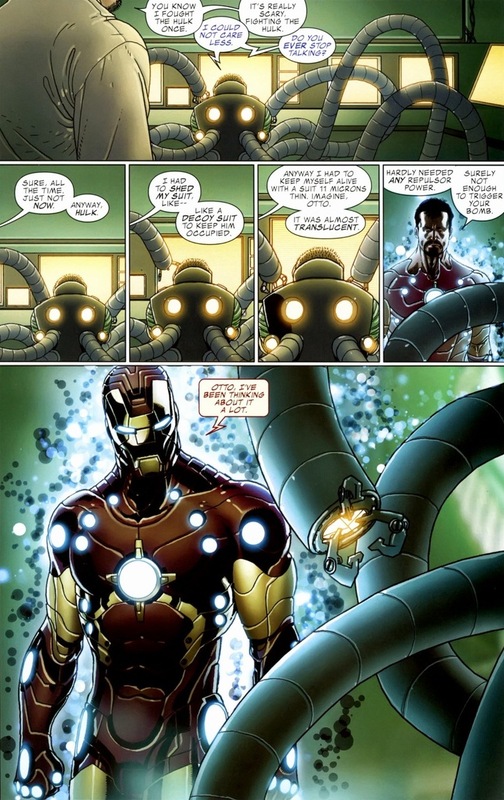 Doc Ock gets Stark’s attention the only way a supervillain should. We get the crippled, dying doctor this time. As you can imagine, he has a proposition. An evil proposition. By the way, if you’re a supervillain who spends most of his time living in caves and underground sewer lairs, it’s hard to get word out about the whole sickness thing. Spider-Man certainly won’t be able to find an appropriate time to insert this info during Avengers dinner, and Doc Ock can’t make a big announcement holding Oprah’s hand or anything. You enjoy ego? You’re going to get 20 images of it. 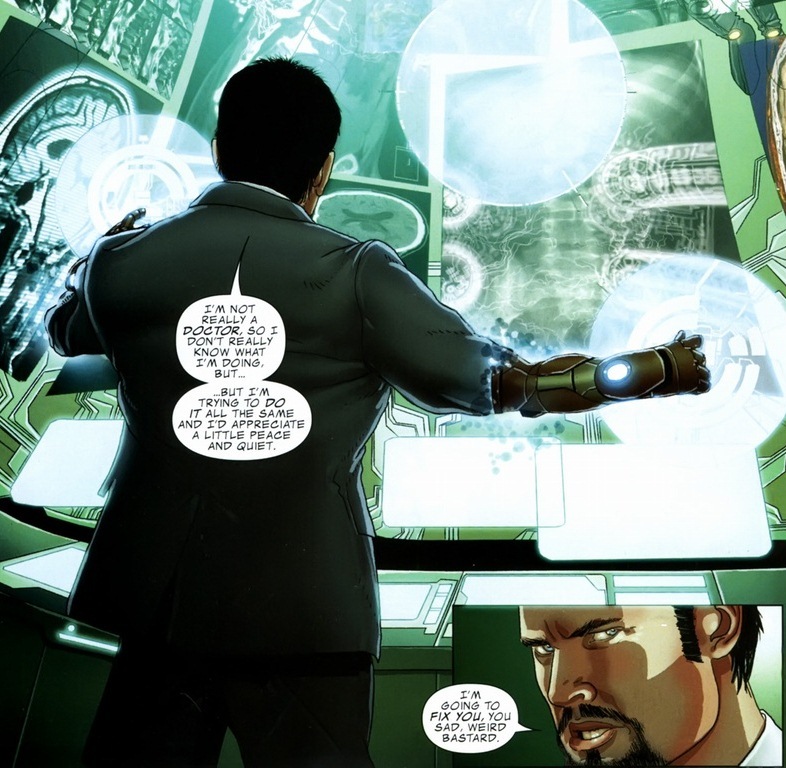 Despite discovering he’s nowhere near as invincible as his series suggests, Iron Man still possesses the self-esteem of a high school star quarterback and Octavius has mastered the art of gloating years ago. 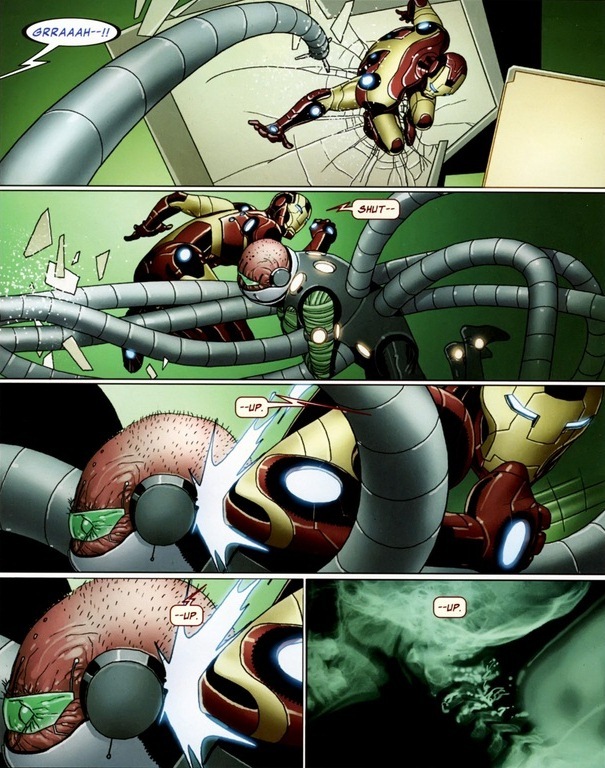 To recap, either Stark fixes Doctor Octopus or admits he can’t do it. That’s it. And oh, how he’ll try — ego’s at stake after all — but not before a verbal beatdown. I mean, the doctor did shoot a rocket through Stark’s penthouse. You must be wondering why doesn’t Stark just laser blast him into space and go about his day texting models. Well, two reasons. 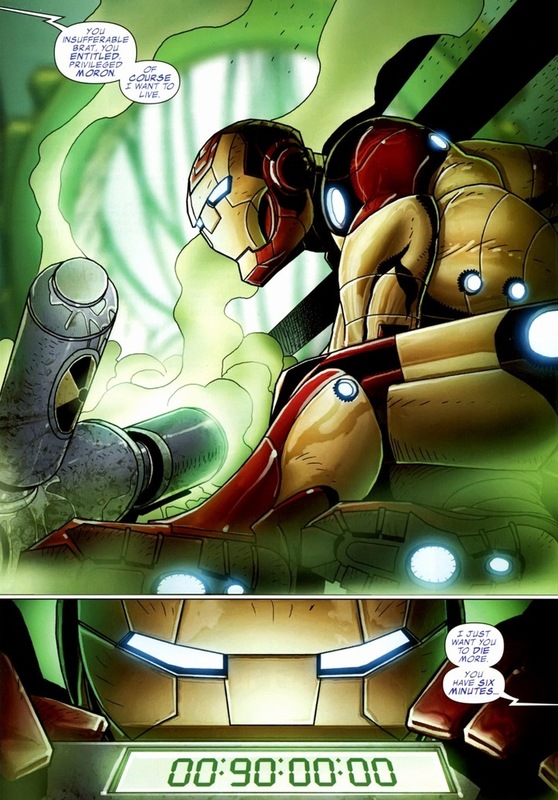 First, and I didn’t show you this, the slightest repulsor blast will cause the nuke to go off. More importantly, his friends are being held hostage by Electro and Sandman. 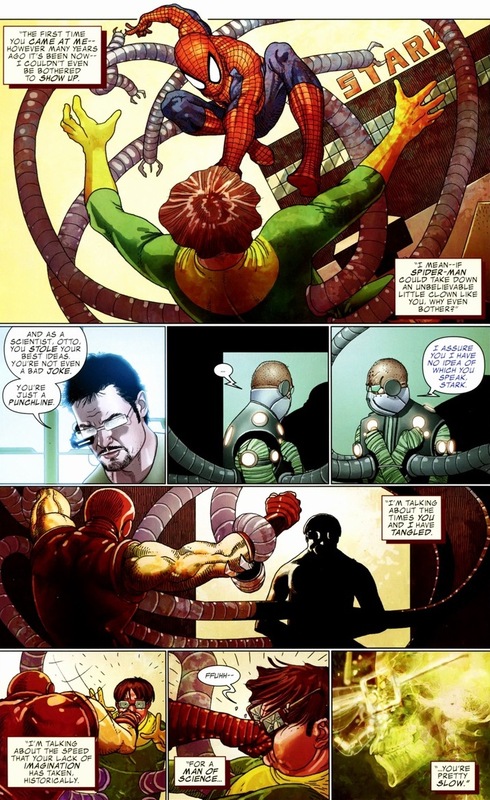 You can make many criticisms of Doc Ock, but the man’s called the Master Planner for a reason. Girl’s been upgraded in the past few years. Far away, the battle of wits commences in the secret Octo-dungeon. And the diagnosis? 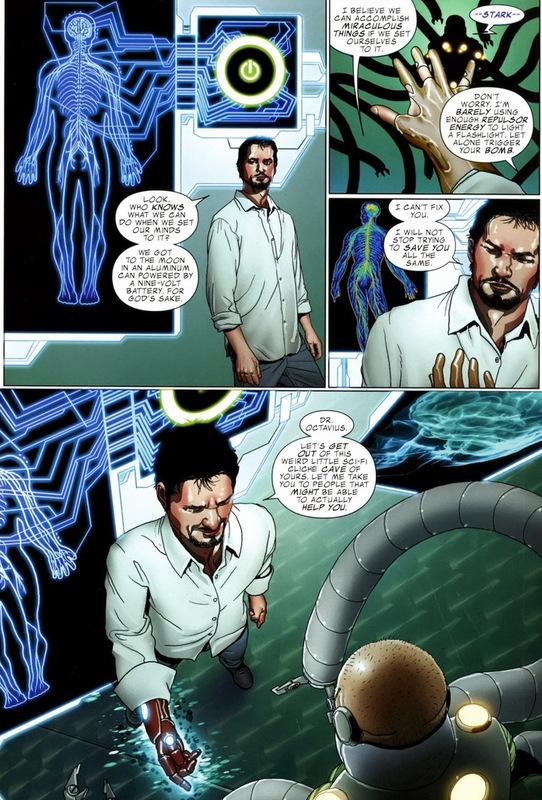 In the next few pages, Stark makes one of the most compassionate and honest speeches I’ve read in comics. Y’know, the problem with being a good guy is taking time to make sure even the bad guys don’t die unnecessarily. It’s a tough break. 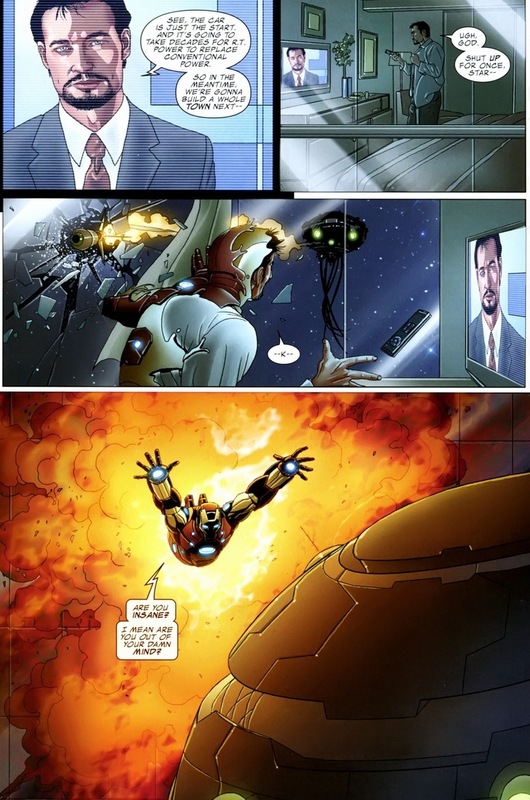 Look, as the violence starts, just remember that Iron Man tried. He really did. 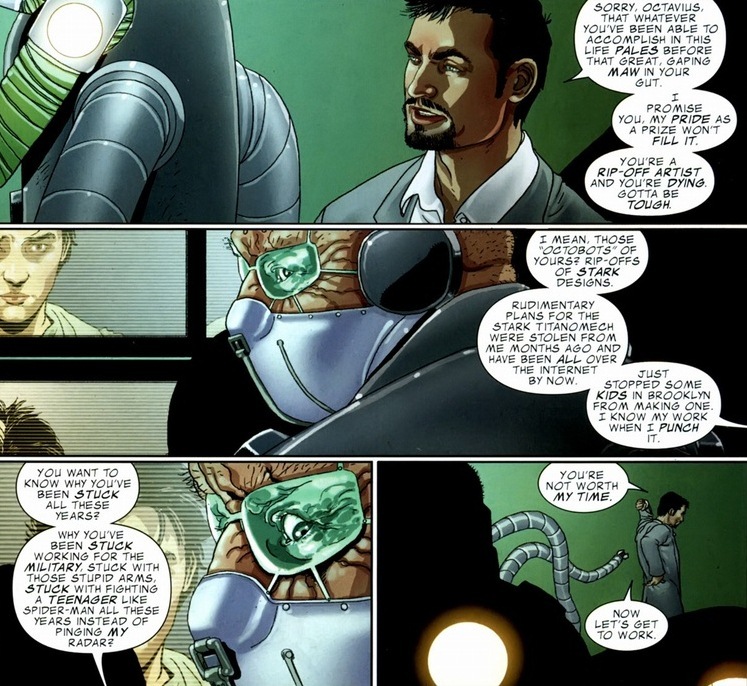 While Stark has matured as a character the past few decades, the same can’t really be said about Octavius. 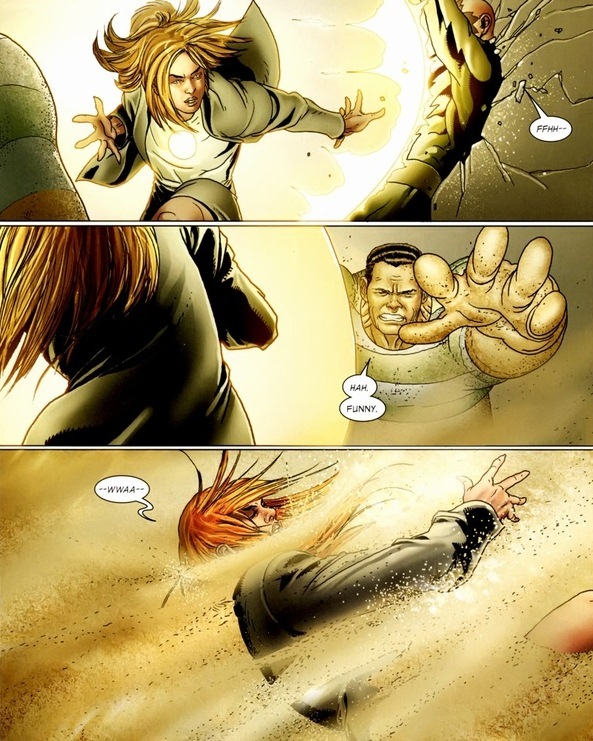 Would Iron Man win this brawl if it continues? 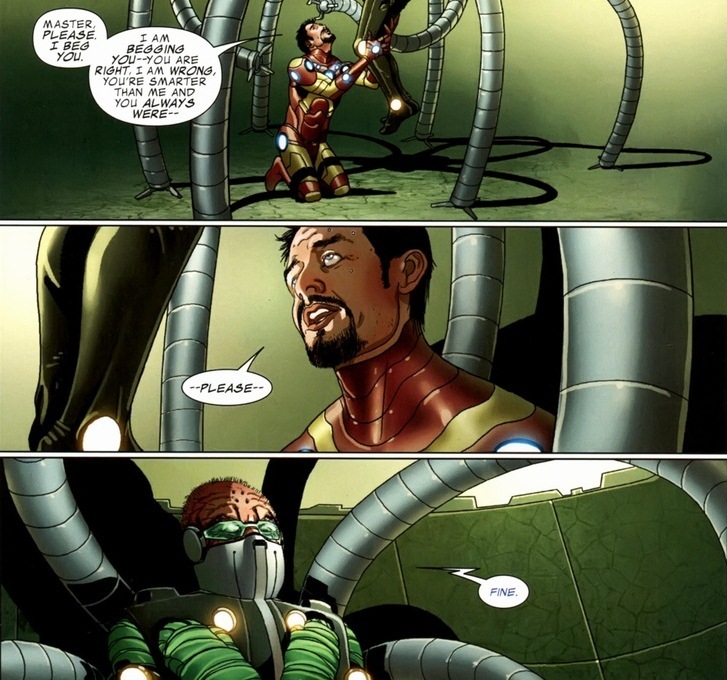 Definitely, but I mentioned it before — Doc Ock prepares for everything. He’s an evil, fatter version of Batman. Unpredictability and back up plans for back up plans have made Doc Ock one of the most dangerous Spider-Man villains, with his metallic arms usually the least powerful of his weapons. 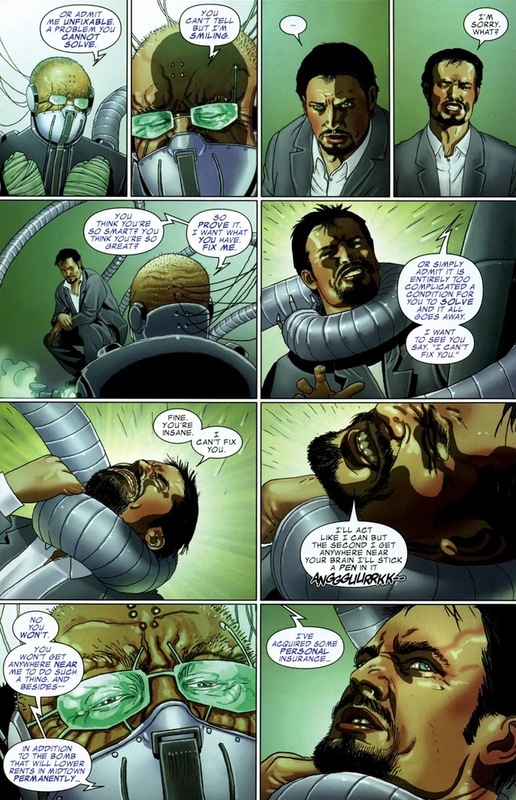 And when Stark faces the situation at hand, he realizes the truth: he just lost to Doctor Octopus. So now, how’s he going to get the bomb disarmed? 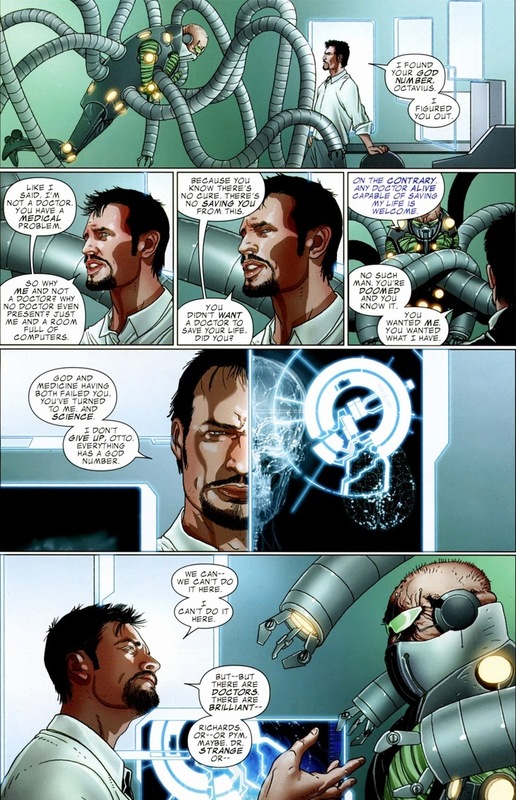 Remember that other option Stark had back in the beginning of the story? You should be uncomfortable. This is an embarrassing moment for all of us. But as a character known for incredible narcissism, having Stark so quickly and easily shed his dignity shows Iron Man as the admirable and respected man we expect from our superheroes. 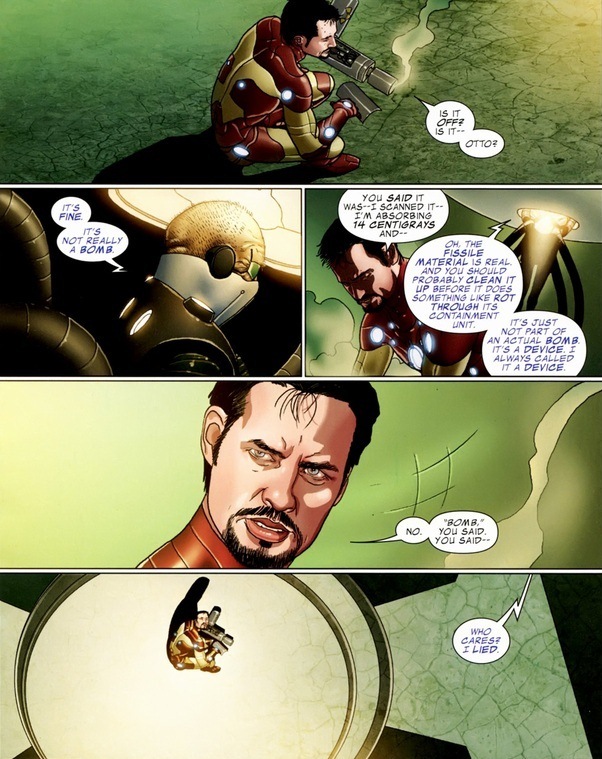 Not the crying and begging part, but the sacrifice of Stark’s self to protect the helpless. That’s literature as it should be. 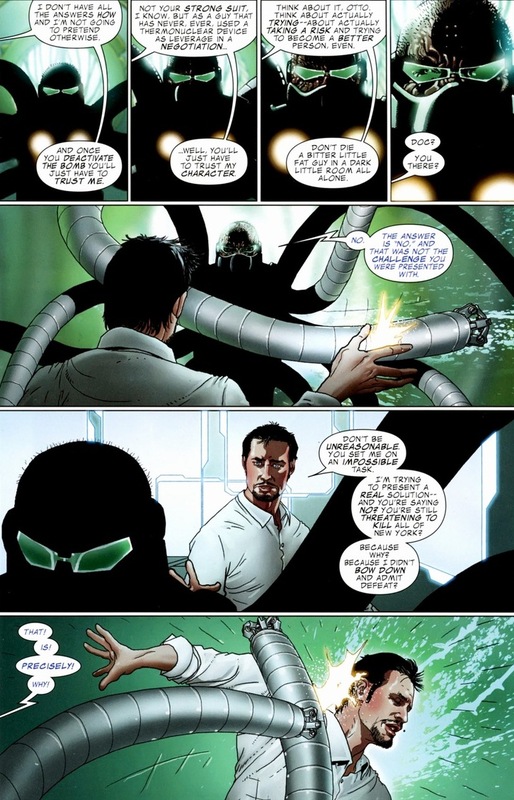 By the way, if you check earlier, Doc Ock totally does call it a bomb. City saved, but a tough day for Iron Man. 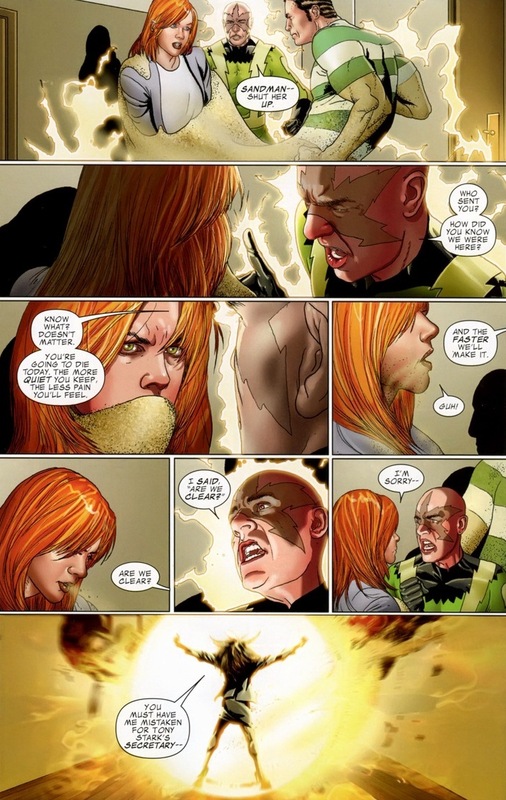 At least Stark has the consolation of Octavius’ impending doom a few months from then. Well, I mean he did until last month. 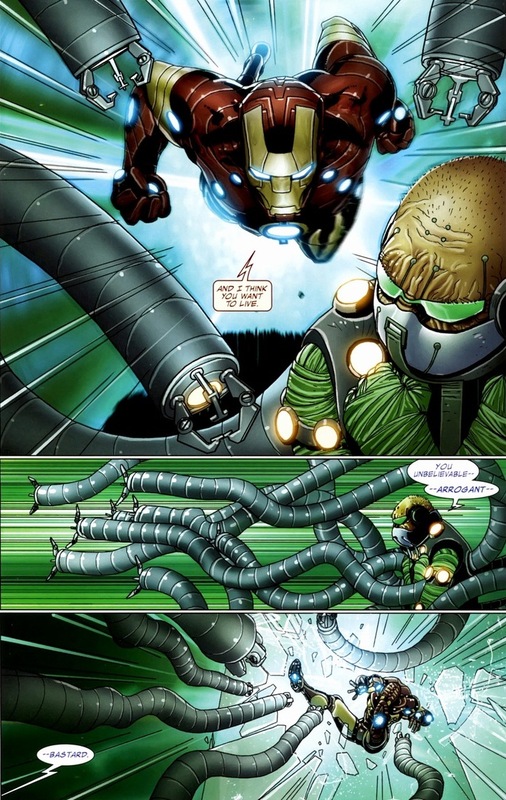 We’re done with Doctor Octopus for a while, I promise. Go check out Superior Spider-Man #1 that went on sale this week — mainly to support Dan Slott and his endeavor in trying to tell new, interesting stories for characters that have been around for fifty years. Seriously, I’ve watched some of the YouTube rants that rail against the body switch and there’re wrong. Every one of them. Our culture thrives through innovation and crazy ideas, so why not let Spider-Man get in on that?